You know, this is really altogether too easy, but if this is what it takes to convince people that running red lights on a bike both commonplace and unsafe, then so be it. 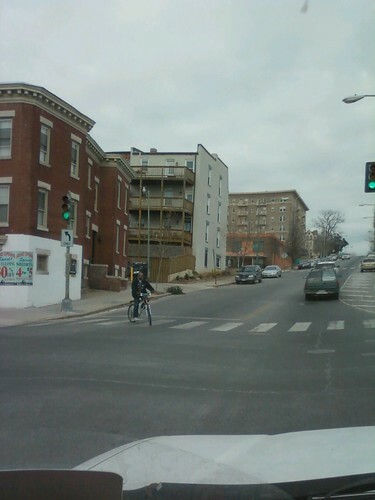 On my way back from having my truck inspected (which is worthy of another post, actually, since things have changed down there) I drove about four miles from the Half Street inspection station back home to Columbia Heights. Downtown, a cyclist ran a red light in heavy traffic two cars ahead of me. Naturally, since this was on my mind, I pulled out my camera, ready for the next one. That didn't take long. Below, joker cutting me off at 13th and Florida. 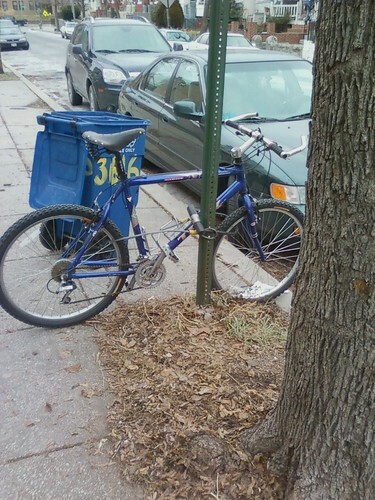 Once home, I also snapped a picture of one of my neighbors who, for reasons that completely escape me, parks their bike crossways to the sidewalk. It's here often, blocking a good chunk of the sidewalk, and actually sticking into the street. While I would never dream of purposely hitting their bike while parking, it is certainly an inconvenience to both people parking and pedestrians, and sooner or later someone's going to hit them accidentally. I can't think of any rational reason why they don't just park sideways in the treebox so it doesn't block anything. Or alternatively, in their ample front yard, which features a chain-link fence. Yet every day it's like this. Another person parks their bike to a light pole on the sidewalk near my house. It's white. I call it the "ghost bike." But they always park parallel to the road, so there's no problem. I like the ghost rider. One other thought I had related to cyclists who argue that red-light running only endagers themselves. Though I strongly disagree with that premise in the first place, I assume that you likewise don't think people should adhere to applicable seatbelt and helmet laws? There are consequences to putting yourself in harm's way that extend beyond your own, apparently not that valuable, life. Were you snapping those photos while driving? personally, i dont care if people wear helmets or seatbeats, ( or jaywalk or jaybike for that matter) but i'd have nightmares for the rest of my life if i killed a biker while driving. those nightmares alone would make me want to kill the biker i killed. also, whats changed down at inspection central? mines coming up next month, i think. Yeah well honestly I don't give a crap about whether people obey helmet and seatbelt laws either, since I think stupid people should be allowed to kill themselves (as long as it doesn't involve other people). But it just seemed like a point of hypocrisy, in that they'll defend their right to do something stupid in one case but not in another. Inspections are for emissions only now: no more safety inspections. I'll post about it soon. ... and the "pre-teens" are here.